Watch out, Sinterklaas is coming to town! (TUDELTA.37) | J. Ricardo Mejía S.
If, on December 5th, you’re molested by an old Bishop flanked by black-faced bodyguards wearing Rasta wigs and weird clothes who start throwing food at you in the streets, don’t call the cops, it’s all part of the Dutch holiday fun.Sinterklaas, a.k.a. Sint Nicholas, is a saint. He lives in Spain, has a long white beard, and every year in late November he boards his big steamboat and sails to Holland, accompanied by his white horse, Schimmel (Mold, yes, mold), and his servants, gangbangers by the name of Zwarte Piet (Black Pete). His arrival here is the signal for Dutch kids to put their shoes in front of the fireplace (or more likely nowadays: next to central heating radiators). Prior to December 5th, Sint rides his horse up onto the roofs of Dutch homes and then sends Zwarte Piet down the chimney to put candy in each kid’s shoe, although, again, nowadays it’s more likely to be computer games or even cash filling the shoes than candies. On Dec 5th, young and old alike exchange surprises, which are handmade presents, like, say, a papier-mâché Buddha with a real present hidden inside. With the surprise comes a rhyming poem (doggerel), written by the giver, who mentions things that have happened in the surprise receiver’s life, while also seizing on the opportunity to gently or not so gently make fun of some of that receiver’s character defects. Speculaas and marzipan are Sinterklaas sweets. And pepernoten (mysterious brownish lumps) are what Zwarte Piet throws at passers-by. 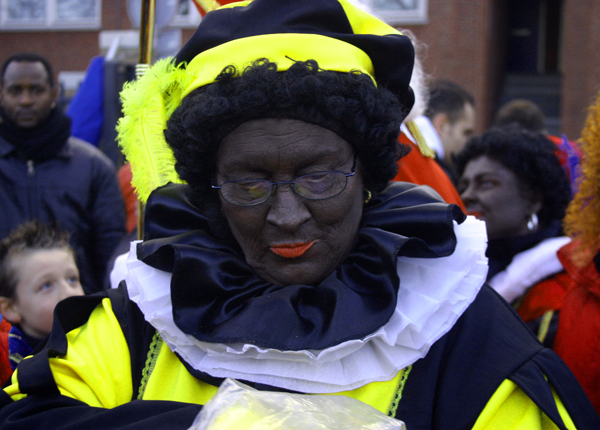 Darker-skinned international students may have a problem with Zwarte Piet, finding it politically incorrect for white folks to dress up like black men and go around scaring the bejesus out of little kids while, at the same time, working as a slave for the white Christian cracker on the horse. To this, Dutchmen less sensitive to minority concerns would reply, ‘too bad, and if you don’t like it, why don’t you go back to where you came from’, while the better sort stress that Piet’s face has merely been blackened by chimney dust. But nowadays it doesn’t much matter, since Zwarte Piet’s traditional threat to put ‘bad’ kids in his sack and take them back to Spain is an offer most Dutch kids would happily accept – especially if they’re going to Ibiza.